Violinist Marie Hall (1884-1956) was one of the great instrumentalists of the Edwardian era. She left violinists a beloved legacy: she was the first person to record the Elgar violin concerto* and she was the dedicatee of The Lark Ascending by Vaughan Williams. (Wikipedia claims that Hall aided Vaughan Williams in the composition; I'd be interested in seeing if there is any surviving evidence that might help us understand what kind of a hand she had in helping him.) Her strength of spirit was clearly inversely proportional to the size of her frame! 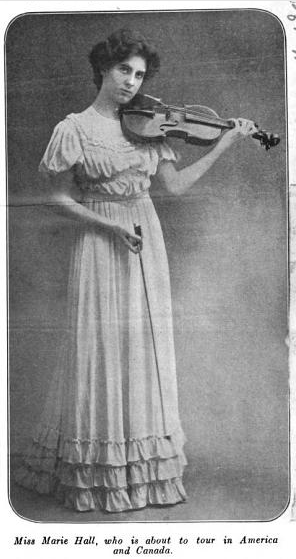 This is an article she wrote for the English Illustrated Review in 1908 called "The Career of a Violinist." In this part, she discusses her Dickensian childhood, her daring ambush of Jan Kubelik (the Heifetz of her day), and her "disinclination to observe rules." A dreary wet evening in Newcastle-on-Tyne; the rain coming down straight, steadily, unceasingly; the streets all slush and the footpaths little better; the passers-by all looking profoundly cold, wet and miserable. Outside an hotel which had just been lighted up for the night stood a poorly clad girl of about ten years old, playing a violin. People passed in and out of the hotel, without taking any notice of her or her playing, but still she played on. Then suddenly a window in the hotel opened and someone threw a coin out that lighted somewhere near the violinist, gleaming as it caught the light of a lamp, lying half hidden in the mud. The girl picked it up and...that is how I earned my first shilling by playing the violin. A few years later at my first concert at St. James's Hall I made £500. I was born in Newcastle-on-Tyne, and at that time my father had a very good position as harpist in the Carl Rosa Opera Company. I was called by the way, the "Opera baby." Some years later he gave up his position, and then misfortune after misfortune fell on my family. We got into very straitened circumstances and money had to be made somehow, and the "somehow" resolved itself into our playing in the streets. I hated doing it, but more especially I hated taking and, above all, asking for money. But necessity knows no scruples and I did it. My father, as I said, was a harpist, and he determined that I should devote myself to learning to play the same instrument, and I was equally determined that I would learn to play nothing but the violin. The struggle between us went on for some time, but at eight years old I won, and to my immense delight my father consented to give me lessons on the one instrument I had longed to play ever since I was capable of wishing or longing to do anything. My family moved from Newcastle to Malvern about this time, and a very bad time it was; until I was thirteen I played in the streets, sometimes picking up a few pence and occasionally sixpences. People used to ask me into their houses to play, and in this way I gradually made friends, very kind friends some of them were, too. They subscribed together to buy me a violin. The money amounted to £15, but my father thought it would be better to utilise the money in getting lessons from Wilhelmj, and accordingly I went to Birmingham to do so and whilst there made plenty of friends. Max Mossel heard me play, and on his recommendation I got a free studentship at the Birmingham School of Music for two years. But a great disappointment awaited me after this. I won the first Exhibition at the Royal Academy of Music, but alas, could not keep it, as I had not sufficient money to live on in London, and so had to go back home, sick and sore at heart. My family was now living at Clifton; shortly afterwards a chance circumstance led to my meeting a Mr. and Mrs. Roeckel, who have been the kindest of kind friends to my family, and from that date I may say my struggles, with financial difficulties at all events, ceased. One day, shortly after my return to Clifton, my father was playing the harp in the street and his skill and execution attracted the attention of a gentleman and his wife who spoke to him. They were Mr. and Mrs. Roeckel, who curiously enough had heard my uncle playing at Llandrindod when they were on a holiday in Wales. Both had been greatly attracted by my uncle's playing, and were very much interested at hearing that my father was a brother of the Mr. Hall whose playing in Wales had so pleased them. A friendship sprang up between the Roeckels and us from that date, and to their kindly aid I owe the fact that I was able to make my début on the concert platform under rather favourable circumstances. I was just fifteen then and the concert was given at Bristol. I did not feel really nervous, but I was very excited and I suppose rather anxious as to the result. Anyway it was a great success. I am almost forgetting that the editor of this Magazine asked me to tell some anecdotes about myself of which he says he is sure I must have many that are interesting to relate. I am not so sure about that, but I take it the editor's request is a polite way of saying that stories are more interesting to the general reader than succinct autobiographical matter, so let me see what anecdotes I can tell. It is not easy to recall them at once, but some incidents in my career stand out very clearly, landmarks in my life that will never be obliterated from my memory. I will always remember the day I asked Kubelik to hear me play. My father and I had heard him play in Bristol, and shortly afterwards I saw that he was giving a recital in London. I made a desperate resolve that, come what might, I should personally ask the great master to hear me play the violin. It was, to be sure, a forlorn hope, but I was desperately in earnest and resolved that nothing but physical force would prevent me from carrying out my intention. Accordingly I stationed myself outside the concert hall when the recital was finished, with the purpose of waiting there until Kubelik came out, and then asking him to give me a hearing. I waited, I do not know how long - it seemed hours - but at length the great violinist made his appearance, and in an instant I was at his side, putting forth my request in what was, I daresay, rather wild language. Kubelik shrank away from me. "I do not think I know you?" he said. I wonder, did he think I was mad? I was mad, mad with excitement, and determined to gain my point, and at length I did. Kubelik gave me his address and asked me to come to where he was staying the following morning. I went, and found him and his accompanist together, and I have an idea they both regarded the affair as a little joke. I asked Kubelik to accompany me, and with a reckless daring I played the very piece he had given at the concert the day before. When I had finished, both he and his accompanist jumped up to shake me by the hand, and rushed at the same time to place a chair for me, with the result that I sat down...on the floor. Kubelik at once declared I must go to study under Professor Sevcik, at Prague, his own old master, and arranged to introduce me to him, and a little while later I went to Prague. I have pleasant recollections of my studies there. Prague is a very sedate place, and it is not considered at all "the thing" for girls to go about by themselves. I have always had a disinclination to observe rules, silly rules I consider them, of this sort, and consequently very often broke them, shocking a great many people I fear by doing so. I remember on one occasion I went to dine with a couple of girl friends at a restaurant in Prague, and near us sat two elderly ladies who glances in our direction from time to time with looks of mingled pity and stern disapproval. One of them, as we passed out, observed to her companion "that it was a pity to see such respectable looking girls behaving in such a fashion." Curiously enough, some years later, I observed that very lady sitting close to the platform in St. James's Hall when I was performing, though whether she recognised me as being one of the respectable looking but badly behaved girls she had seen some years before at Prague, I cannot say. But I did not really amuse myself very much at Prague. I worked tremendously hard, often practising for fourteen hours a day. I may mention that I was the only English girl pupil Professor Sevcik had. [Author's note: Vivien Chartres also studied with Sevcik, although one could argue Chartres's nationality...] He lent me an Amati violin when I came out in London, and I played on it for several years. It was the same violin that Kubelik had played when he made his first appearance. I love the colorful way people used to spin a story. Thanks for unearthing this, Emily! Very interesting. How do you know she was the first to record the Elgar? With which orch/conductor did she record it? Her recording was made in 1916 with an unnamed orchestra and Elgar on the podium. Due to the length of the work she played an edited version that only lasted twelve minutes. Elgar actually rewrote his cadenza so that the recording devices could pick it up. The performance is available on CD and is actually an incredibly fascinating document. It sounds nothing like our modern recordings - tons of portamento! You can hear clips of it if you go to Amazon and look up "Marie Hall" under mp3s (or you can buy the entire twelve minutes for a few dollars). It may not be to some people's tastes, but I feel like Hall did an extraordinary job, given the difficulty of recording at this time in history. Definitely an aural document worth searching out, especially if you have any interest in Hall, Elgar, or nineteenth and early twentieth century performance practice. Oooh, wikipedia says her recording was in December but gives no references.I shall continue to believe she was the first until solid evidence turns up otherwise! Thanks for that! Hmm, I wonder if release dates would be taken into account when people label one or the other "the first recording"? I.e., if Sammons was recorded in October and Hall in December, but Hall's was released earlier, whose would be "the first recording"? I will add an asterisk to this entry so people know there's a controversy. Well, for certain she made one of the first recordings, and was the first to record it with Elgar on the podium, and that definitely counts for something! my first teacher at college studied with Sammons. He said that Sammons showed him a letter from Heifetz thanking him for the recording and saying that it had been helpful in his understanding of the work. I love the way she pounced on that performer as he was leaving the hall, unrestrained by proper etiquette. She unquestionably would not have gotten where she did without such charge!